Queen St has had a 30km/h speed limit for over a decade and the rest of the city centre is set to join it. Auckland Transport is planning to introduce a speed limit of 30km/h in the city centre to make the streets safer for growing numbers of pedestrians, cyclists and residents. The new speed limit will cover an area bounded by the central city motorways and go out for public consultation in November with a wider package of lower speeds. AT wants to drop speed limits on 700km, or 10 per cent, of the city’s roads to address a sharp rise in the number of serious crashes in Auckland. Town centre roads like Broadway in Newmarket and Tamaki Drive in Mission Bay and St Heliers will have their speed limit reduced to 30km/h or 40km/h. Between 2013 and 2017, the number of road deaths in Auckland rose from 48 to 64 and serious injuries rose from 438 to 749. Just 2.2 per cent of serious crashes occurred in the CBD, but Heart of the City chief executive Vic Beck told the Herald there was a higher number of accidents involving people walking, cycling and riding motorcycles. That 2.2% of DSIs might not sound like much but you also need to consider that the land area of city centre makes up just 0.4% of the Auckland region. The chart below (from here) shows how this breaks down for the city centre. Mayor Phil Goff said Auckland had to address road safety issues with too many people dying, but would not publicly back a 30km/h speed limit in the CBD. “I expect Auckland Transport to make decisions on speed limits which are evidence-based and result in bringing down the road toll. “I understand lower speed limits in the city centre may not greatly affect actual journey times for much of the day because traffic density already results in lower car speeds,” Goff said. Hey, as replied to @simonbwilson I support @AklTransport reducing speed limits where that saves lives and prevents injuries. Decisions should be evidence based and determined area by area. Phil seems too scared of backlash on this and is the ambulance at the bottom of the cliff approach where we wait for someone to be killed or injured to provide the evidence of need before thinking about making changes. While the speed limit change is primarily about saving lives, slower, safer streets will be good for helping to achieve other goals too as it makes it more pleasant to walk and cycle which would further help retailers too, especially hospitality. As I replied to him, where’s the evidence that the current situation was safe or appropriate to begin with. Perhaps we should be taking the approach of making our roads safe first and then look to raise speeds where it can be proven it’s safe to do so. Regardless, the evidence is there and we just need to look south to Christchurch to see the outcome of the same change two years ago. In comparison to Goff, AT’s comms have been good. “If a person walking is hit by a vehicle travelling at 30km, the chance of dying is 10 per cent. At 50km, the chance of dying is 80 per cent,” he says. One of the big shifts that we’ve seen over the last few years is significantly more people living in the city with the estimated population rising by almost 20k (to just over 50k). 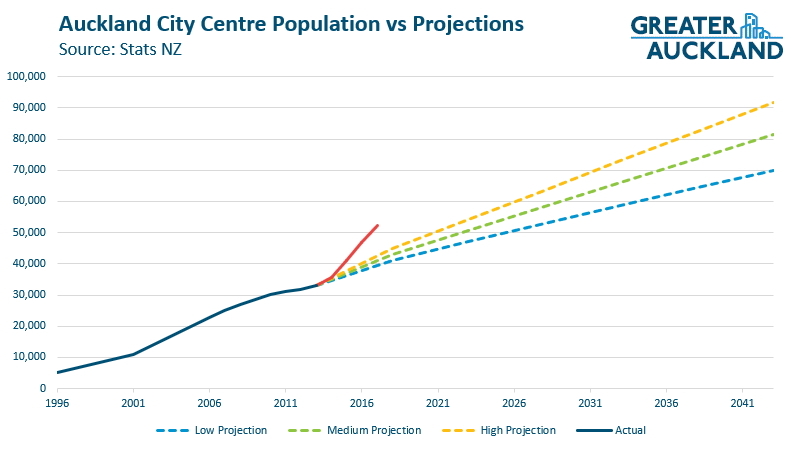 To put that in perspective, there are now more people living in Auckland’s city centre than do in all of Invercargill and that’s before you consider other factors, such as how many people are staying in hotels. These residents deserve safe streets just like everyone else. Unlike those jumping in their cars or on PT to exit the city, these people are the ones who are more likely to be walking the streets. In many of the opinions already expressed about this proposal, there’s the idea being pushed that 30km/h is fine for some parts of the city but not the big roads connected to the main motorway ramps. One such example being the AA. The Automobile Association’s principal adviser for infrastructure, Barney Irvine, said lower speeds in a lot of CBD streets was a no-brainer where there were many pedestrians and distractions. But on busy multi-lane streets like Hobson, Nelson and Fanshawe Sts that connected to motorways, reducing speed limits might not be the answer, he said. “There’s a risk on these bigger roads that we change the speed limit, but don’t get the compliance, because 50km/h still feels like the natural driving speed,” Irvine said. 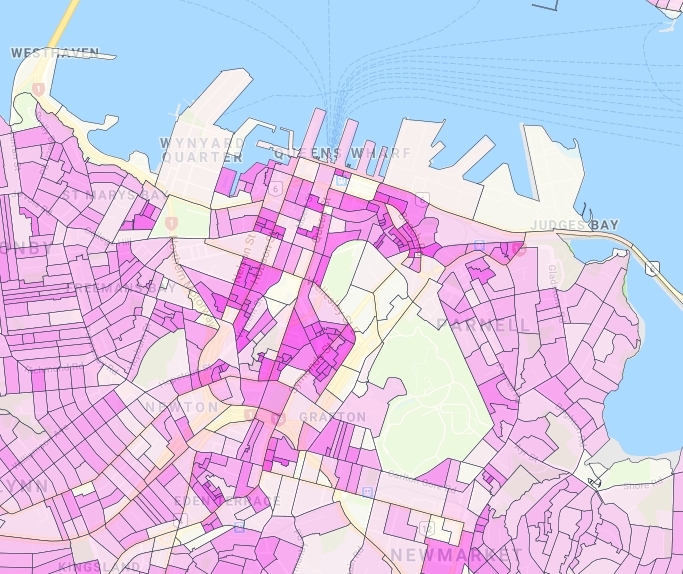 What is often forgotten in this line of thinking is that Hobson and Nelson streets are one of the densest residential areas in the entire country. Below is a density map from Koordinates based on the 2013 census data and you can see the darker patch around the southern end of Hobson and Nelson. Given the growth that’s occurred in the city and numerous developments that have subsequently taken place, this number is likely even higher. While there’s a general acceptance that some city streets are slow to travel in a car, it’s worth questioning just how much impact a change would have even on these roads. 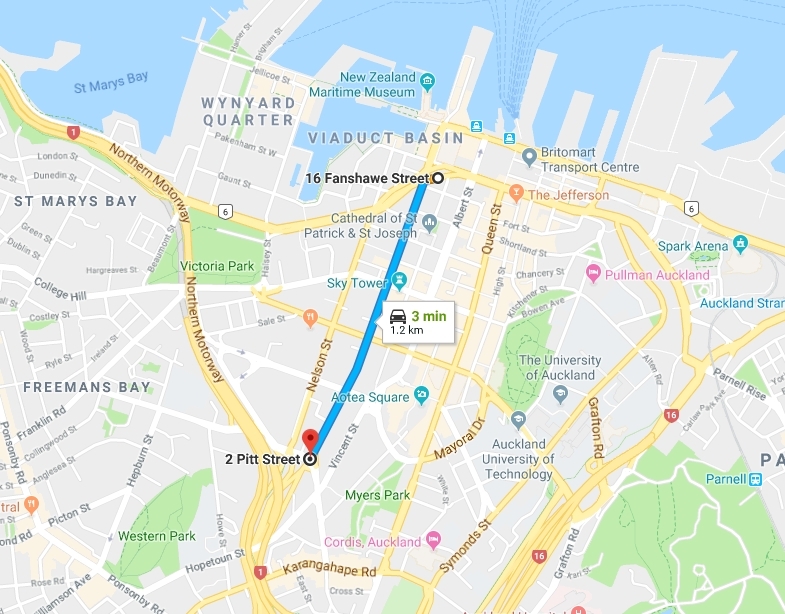 Thanks to the power of Google I looked at how long it would take to get from the exit of the Downtown Carpark to the SH1/16 motorway on ramp at the southern end of Hobson St, a distance of about 1.2km. This was based on travel at just after midnight and works out at an average of 24km/h. Changing the travel time to the afternoon peak resulted in it estimating up to 12 minutes to travel or about 6km/h. Let’s not forget that just over a year ago a man died on Hobson St.
AT say they’ll be consulting on the proposal in November and it’s obviously something we’re going to follow closely. Even if you could travel that 1.2km of Hobson St at the existing / proposed speed limits, the difference in time is… 58 seconds. In practice, the actual time difference is less, due to traffic delays in both cases. Yes, every German I know in the city has been asking for this for years. Travel time reliability is more important to most people than travel times on the shortest trip anyway, and lower speeds contribute heavily to travel time reliability. Those crashes due to speed really slow the network down. We’ll be so much better off when they roll out 30 km/hr across the city. Coordination in Auckland is almost non-existent. But where we have had coordinated signals we have a long history of them being coordinated faster than the speed limit. Pakuranga Road was the first coordinated with SCATS and it was coordinated to a speed well above the speed limit. One more instance where the authorities have encouraged or mandated faster speeds. There’s quite a list I’m compiling. The organ players haven’t arrived at their state of neglectful ignorance without help from our RCA’s and authorities. AFAIK SCATS is usually coordinating all the time, but it does it in a way that is not intuitive to the driver on the street. It usually lets people start earlier at the previous intersection if there is spare time, rather than make them wait there until the planned time. So they arrive to a red at the next intersection, rather than a green, because technically they are early. From what I can tell from driving along them, Hobson/Nelson seem mostly coordinated. Probably at much higher speeds. They just get blocked up at the end point. This may sound heresy to some but is it time to change SCATS programming for the CBD? I understand SCATS was developed to maximise car flow. If that is no longer the objective then it needs to be changed. So for the CBD maybe going back to old style fixed signal timings with only interrupts for PT priority may be better? Do we still need SCATS in the CBD with a 30 km/hr limit? Is there a better tool? There probably are better tools, but they probably cost a lot more and there will be problems trying to get them working in Auckland. Last time I heard, SCATS is basically free compared to alternatives. The “NZTA” of New South Wales looks after SCATS and they just hand it out to anyone who wants it, as is. NZ is mostly locked into SCATS because it is so cheap and does a decent job(for cars), it is hard to justify bringing in an much more expensive alternative. 🙂 Except that the justification is that we are now not designing for cars, but for people. Therefore a biased tool is a weapon against us. Agreed the coordination need to be adjusted with the new speed limit. Also the coordination should be set at speed limit. Not above speed limit. It just encourage people to speed. The way the current traffic light design is it will turn red if it detects no cars. So in practice, if you drive 30kmh, the traffic light will turn red by the time you approach. So you may need to stop for every traffic light. The journey time will likely triple. If the change the speed limit to 30km, the phasing of traffic light also needs to be adjusted to make an efficient traffic flow. Also since cars move slower, the traffic light phasing needs to be longer to ensure the traffic has enough time to accelerate and clear. That would mean longer wait time for pedestrians crossing the road. I don’t think changing the phasing will be an insurmountable hurdle. Also a lower speed limit doesn’t reduce the rate of acceleration, it just means maximum speed is hit quicker, should have mimimal impact on the ability to clear an intersection. One of the recommendations of the Road Safety Review that AT committed to ‘in full and with question’ was running a public information campaign about the benefits of lowering the speed limits, in 2018. They’ve had the review since February – I think that’s when the board approved it. Now it’s late September, and there’s been no public information campaign. Did AT not expect a public backlash when they set about implementing the necessary lower speeds without meeting their commitment to educating the public like this? sorry for typo. Levy said they adopted the recommendations ‘in full and without question’. Goff’s playing the politics game and loses any respect I had for him. One foot in each camp. You want safety AND inappropriate, killing, speeds, Goff? Yeah right. AT have chosen the central city based on evidence; did you even check with them before trying to sound knowledgeable by saying that it needed to be evidence-based? In terms of it needing to be area-by-area, the evidence is against that, Goff. The evidence is that cities should lower their speed limits across the whole city at once. That’s how you bring in the transformational change in mindset that is required. The transformational change that you were asking for, when you were courting the votes of people who want safer streets. “The Automobile Association’s principal adviser for infrastructure, Barney Irvine, said lower speeds in a lot of CBD streets was a no-brainer where there were many pedestrians and distractions. Irvine makes a good point, some of these roads are designed for way to fast a speed. Hobson and Nelson for example, five lane one way drag strips through the middle of a residential area. I agree with the AA that they should be modified to present a 30km/h natural driving speed. “Auckland Chamber of Commerce chief executive Michael Barnett agreed with plans to reduce road deaths and injuries, “but with limited resources it’s important that the safety spend is where they can get the best result not the best headline”. So Barnett is asking for value for money in the face of limited resources. I can’t see anything being cheaper to do than put up a dozen speed limit signs and gazette a bylaw. Actually you could just shift the 30km/h signs from Queen Street a few blocks out in each direction. I’ve got a shovel for me and Barnett if he is worried about resources, we’ll have it done in an afternoon. More bang for your buck if you just change the default speed across the city to 30. Only roads with separated cycling infrastructure and safe pedestrian amenity should be higher than this. AT has adopted Vision Zero, so this is what we must demand of them anyway. One of the outcomes might be the clamour for the separated cycleways and great pedestrian amenity so the speed limits can be raised in individual streets. Except that I’m not even sure people will want the high speed limits again – overseas, once the lower speed limits come in, people like it, and demand more of it. Heidi, I wasn’t suggesting we wait for design changes to lower speed limits. More that a lower speed limit gives carte blanche to redesign streets accordingly. The design speed for a 50km/h road is 60km/h, for car safety. This becomes entirely indefensible once the limit is 30. Yes, and the redesign of those big wide streets is really like having a blank canvas, isn’t it, once the design speed can be lower. So much possibility there. At the “Jane’s Walk” I went on recently, it was hard for the group to even hear the guides on Hobson St! Foul infrastructure that is such a blight on a city trying to be world-class. The pattern language pattern of repairing the worst bit first, while leaving alone what works is useful here: in the CBD, those big roads need the diet immediately. Our first obligation is to keep people alive and uninjured. Some people may not comply with a lower speed limit, but some people will. And ANY car driving slower is safer than that same car at a faster speed. There is no evidence that speed variance leads to DSI. But there is ample evidence that average slower speeds lead to lower DSI. There is also ample evidence that if some cars are going slower in a lower speed limit area, this will encourage other drivers to lower their speeds too. If Irvine’s comment is about the poor drivers who might get pinged when it didn’t ‘feel’ right, he needs to get a grip. Driving is a privilege, and they can follow the laws or get pinged for it. Our obligation is not to them, but to the people they might kill or injure. Waiting to lower the speed limits until we’ve re-engineered these streets so that it’s fair on the drivers who are breaking the law will mean continued high DSI. There’s no ethical basis for this delay. A slower speed limit means cars will make less road noise and fume emission. Which makes the area more pleasant to walk. The next thing may be more trees and plants along the street instead of open concrete and asphalt. Disappointing words from the mayor and some councillors. They can’t ask Auckland Transport to be all bold and brave and then run for cover at the very first tough decision. Poor leadership. What about Mike Hosking’s Ferarri? Will no one think of the luxury car owners? So it’s fine that Tamaki Drive floods during King Tides, but heaven forbid anyone use a main arterial at 50 kmh. This is just a sop to get out of having to have hard conversations about parking, proper separated cycleways and takes pressure off AT to deliver works that are well overdue already. How’s the Tamaki Drive Master Plan implementation coming along? We’re explicitly not talking about main arterials here. 30 km/h will probably be set on the smaller local streets and in town centres. All those hard conversations won’t matter if we don’t sanitize our speed limits. I did read the article. Maybe you should check it too; Tamaki Drive is specifically mentioned; not just the adjoining roads in the town centres. Yes, and add Dominion Road, Mount Eden Road, etc. I think they only refer to the parts within town centres, not the entire length of those roads. Addressing road speed limits and Tamaki Drive works are not an either/or. Most large organisations can chew gum and walk at the same time. it’s not either/or but it if you’re going to start doing other different things in the name of safety, then you have to front up about the other things you’re not doing too. Even if it’s just a communication issue; AFAIK there’s no details about an upgrade for the shared path depicted in the Tamaki Drive Masterplan, or concrete plans to extend the seawall and add in a cycle-way separated from the road. If AT is capable of chewing gum and walking at the same time, then it needs to start putting on a show. Absolutely support the thrust and vision . City centre residents will really see some fantastic benefits. We are all tired of daily taking our lives into our own hands simply just to move around the CC. Every day we have those moment where if we hadn’t stopped and had another last look at an intersection we would have been collected by a speeding red light runners. And tired of an entrenched vehicle culture that endlessly prioritises speed/movement, flow, time ‘savings’ over everything else. Even in these latest discussions we are already hearing – ‘yes saving lives all good BUT…what about…” And now too much emphasis on ‘survivable incidents’ – yuck – what sort of acceptable-collateral damage-type philosophy is that. So many excuses, which in the end are just all about cars cars cars. The root cause or of DSi is vehicles.We need to address the fundamental cause of dsi in a meaningful and workable way for residents and businesses. This is a good start. We also want to see efforts to remove rat running thru city zones, which we would like to be able to call neighbourhoods one day. Dream big and make the right choices but we want to know it works and will be enforced. Yes we will obviously all need to work together to make sure this doesn’t get diluted into meaninglessness. 30 kph is a great idea for the city, and residential streets too. The 30 limit around Wynard quarter seems to be respected, I don’t get overtaken on my bicycle around there. That population density map is interesting. I recently started working in Wynard quarter, with its walkable streets, nice medium density euro style apartments, and I wondered where all the residents are. It seems desolate. The map shows a population of TWELVE between Halsey and Beaumont. What a waste! I guess its all holiday and investment property. But still a tiny, tiny fraction of the pop on hobson/nelson/union/cook where it looks like a warzone – the observation is very much on point and a source of endless frustration. Money gets spent where all the apartments start at 1 million. No interest in where the vast majority of normal people actually live. LOL at Rx7 keeping the peace … Disturbing the peace shouldn’t it be? But seriously though, yes the 30km/h reduction needs to be accompanied with some sort of road re-design & enforcement to ensure the 30km/h speeds ‘feel’ appropriate to drivers. Ponsonby Road being 40km/h but with no visual queues for drivers to reduce speeds is largely ignored in my experience. Well just wait until it is enforced. People will not ignore it for long. Like drivers using their cellphones while driving? I guess it’s easier to ping people for speeding. Me? I’ll be ignoring it and driving to the conditions. Pedestrians can take a bit of personal responsibility to ensure their safety by not jaywalking or having their faces buried in their cellphones – among other things. We try to have an evidence-based approach to comments here, Vance. And the evidence is that people using cellphones when they’re walking are more careful at intersections than people not using cellphones. The problem is that drivers are running red lights, not stopping at crossings, and driving too fast to be able to adjust, supported in these high speeds by inappropriate speed limits. Also, the speeds that you find “appropriate to the conditions” are undoubtedy the prevailing speeds. These speeds have put adults off walking and cycling, let alone letting their kids walk or cycle. This has prevented our society from adopting fundamentally healthy transport habits involving physical activity. We’re paying the price in our health bill, and our kids are looking at a life of ill health ahead of them, as a result. So your “appropriate to the conditions” speeds are putting an enormous burden on the health and social systems. I agree that drivers using cellphones needs attention, but have you looked at what AT have said about this – they certainly have committed to taking action on a range of things like alcohol, seat belts and, I think, distractions like cellphones. What’s the demerit points for being caught going 20kmh+ over a speed limit? What about when hitting a cyclist/pedestrian who isn’t “distracted”? Does that mean, Heidi, that I should use my cellphone while out walking for added safety? Seriously, though, I do worry about those who walk with headphones on. Both in terms of roads and trains. 🙂 Not yet, David. Pedestrians with cellphones and headphones are in more danger, definitely. But it appears this is because they’re relying on drivers sticking to the law. They may be looking down at their cellphones, or unable to hear, but it appears they stop at the crossing, and go with the green man, etc, more than we do on average. Unfortunately relying on drivers sticking to the law around crossings is insufficient. It is, of course, insufficient for people who have impaired sight or hearing too. Or low cognitive ability. Or are depressed and not functioning normally. Or are skittish or simply are a child. We need to be thankful to people using cellphones and headphones for bringing the issue to the public conscience. Drivers have a responsibility to vulnerable road users, whether they have all the abilities of a fully alert adult, or not. This is the mantra from the traffic engineers, Anthony, and it’s not supported by evidence. There are certainly places where we need to re-engineer the roads, but the lowered speed limit can, and must, come first. Currently, people who want to drive under 30 km/hr cannot do so in many situations where it is appropriate to do so. New drivers are taught to drive to within 5 km/hr of the speed limit, or it is a mark against them on the driving test. Public pressure to speed up is massive. And all in streets where there are vulnerable users present, so the appropriate speed is 30 km/hr maximum. Every fast car is a danger. Every driver driving at 30 km/hr or lower presents a much lower risk. We need the lower speed limits now, in order to allow this lower speed to become normal. There are plenty of drivers willing to lead the way. Heidi, I don’t think traffic engineers have been repeating a mantra about designing roads to feel appropriate to the speeds. On the contrary, as a collective, they’ve ignored all that important stuff and so we have roads giving constant feedback, which often conflicts with the occasionally posted speeds. I think that ‘self-explaining roads’ and the use of consistent types of road design for different purposes is well-supported by evidence. You probably only discuss this with the traffic engineers who are literate with and care about this stuff and they certainly haven’t been designing the roads for all these years. A few proposals for that I’ve seen for self-explaining roads (or whatever you want to call them) have been contemptuously knocked back by the traffic engineers as being non-compliant with standards and possibly a bit batty. Please note, this doesn’t mean I’m against lowering the speed limits. In fact I favour lowering them right now, before implementing design changes. But I do think that road design is just as important as the number on the sign if we want to facilitate acceptance and make it stick. Especially so in wider areas or where it’s appropriate for different roads to have different functions and different speeds. PS enforcement also works. I posted a while back about how motorways in England are now enforced by cameras (or potential cameras) over every signal gantry, so that one just knows that one will get caught speeding. It helps that everyone is on the same page, so the peer pressure (and aggressive tailgating) evaporates too. It’s a big change to driver behaviour on the motorways, compared to the past. Combined with the variable speed limits, it actually makes the motorways flow better than before, so when everyone toes the line, everyone benefits. Agree. The ‘mantra’ I was meaning was that engineers – even aware, caring ones – say we can’t lower the speeds until we’ve made the design changes. They are ignoring the many, many streets where the design changes aren’t even required – eg dead end residential streets, in which 20 to 30 km/hr feels appropriate but are posted as 50 – and so people are accelerating to 50 or above, and supported by the law. They are also ignoring the requirement that has been on drivers to drive to 50 km/hr, and what a huge shift there will be in behaviour when this is removed. And they are ignoring the overseas evidence, that wholesale, default changes in speed limits can be undertaken first, with redesign of the streets that need it, and even beefing up the enforcement, following. It needs to happen, but it can follow. fra99le: That UK system makes a whole lot of sense. And as I’ve said before, it really shouldn’t be difficult or expensive. All you have to do is have basic video camera’s on each entry and exit and some software to perform number plate recognition. This is all simple stuff these days. It’s an interesting situation. The NZ speed limit legislation currently says that you have to achieve mean speeds within 10% of a proposed new speed limit. So in a 30k area, NZTA need to be comfortable that generally you’re seeing mean speeds above 33kmh for them to be OK with it. That’s why there is often a request for “engineering down” to accompany such speed reductions (or, if there’s no money for that, why a speed reduction request might be refused). I don’t buy this strict philosophy personally because, if the net effect of a reduced speed limit is still reduced observed speeds to some degree (and the corresponding reductions in injuries), surely that is the point of the exercise? So do reduced speed signs on their own work? People tend to use a combination of street environment, posted limit, and general level of compliance/enforcement to determine what speed to travel at. From all the evidence I have seen in NZ and overseas, the rough rule of thumb is that for every 10km/h signposted reduction (with nothing else changing) you get a 2-3km/h reduction in observed mean speeds. So a shift from 50k to 30k might see a 5k drop in observed speeds, even if nothing else is done via engineering/education/enforcement. Might not sound like much but makes a big difference to the likelihood of fatal/serious injuries. -courteous responses to finding pedestrians in the middle of the road, etc. This cultural acceptance isn’t necessarily verbalised, although it can be. Mpre usually it would just be present because its been established by repeated experience. It is a way of driving that is more connected socially. The reason for changing the default speeds across the city at once is that this factor is reinforced everywhere, which I believe will have much larger results than could be expected from changes to 10% of our streets, where the prevailing culture will still influence the speed that people choose to use. Agree – stop spending money on useless/annoying/noisy speed bumps and instead spend it lowering speed limits on residential streets and enforcing them with speed cameras. AT should drop the speed limit on all residential streets to 40 tomorrow. I believe Wyanard Quarter should have higher residential density. The current low raise building is a waste of prime land. With only low raise building, the residential density will be too low to support local shops and amenities. So what we get is empty streets and dead nightlife. Hopefully there’s an opportunity to lobby for it to be widened e.g. to Ponsonby Road. This should be 30kph given the huge number of pedestrians and cyclists. This is a great plan for the absolute innermost parts of the CBD. But how big is the CBD? Now, I urge everyone here to take the 30K CHALLENGE. After rush hour has subsided, arrange to meet a friend at Dizengoff or Bambina at 10:30 am. At 10:00 precisely, set out from Ponsonby Central in a car, if you have access to one, and drive along Ponsonby Rd at 40Km/h. It’ll feel like you’re speeding, but don’t worry – relief is in sight. Turn left into Hopetoun Street and slow to 30 Km/h. Ignore honking courier drivers and irritated lycra-clad speedsters – they’re running their race, you’re running yours. And ignore unwanted attention from the footpath as you cruise. Proceed in a stately fashion across the Hopetoun bridge, make a left into the. maelstrom of Pitt St. Wait your turn at the lights and ignore cyclists who run red lights – there’s great ambiguity there, and it’s not your battle. Just wait, for the 5 second right turn arrow into Nelson St. Charge down Nelson St but NEVER EXCEED 30K. Go all the way to the bottom, at Fanshawe St, and join the bridge traffic. At this hour, there won’t be any. Go straight ahead to Beaumont St avoiding the Bus Lane That Never Ends, til just before the lights. Turn left, then right up College Hill, again making sure that the need to accelerate up the hill doesn’t prompt you to recklessly hit 35 Km/h on that steep incline, and pop a speed camera. Ignore e-bikes passing you on the right – you’re heading left at Three Lamps. Finally, unleash your horses and charge down Ponsonby Rd at 40Km/h, arriving at your destination to greet your friend. Easy! The future feels great! “ignore cyclists who run red lights” – like drivers never break road rules? I would say the majority of people driving (including myself) exceed the speed limit by some amount on every journey. There is a stop sign on my way home that I have never seen anyone come to a complete stop at (unless someone is coming). There are double yellow lines up a hill that I see at least one car cross over every single day. Almost every day I see someone go around the wrong side of a traffic island to overtake queued cars. If you think its only cyclists that break the rules you are clearly blind. I am regularly passed on my e-bike on double yellow lines that go around blind corners on a hilly route in Wellington. I am doing 20-30kph up this steepish hill that’s only a few hundred metres long and people can’t wait 2-20 seconds for a safe place to pass. At least twice I’ve had to leap off my bike when someone has had to do an emergency evasion back onto the lane to avoid oncoming traffic. Oh and there is a shear rock face on the left hand side so there’s no moving left to avoid death or injury. It boggles the mind what people are thinking making these manoeuvres. Sounds like you want to use a public road as a race track, there’s one of them down at Hampton Downs if you are keen for some racing. Just do the whole route on an ebike. Much more fun. OK then let’s just do it. Make inner Auckland 30km/h and think about whether we still need judder bars and bike lanes. Pedestrianise Queen St and figure out points of access and drop off. Work on the other bits of pedestrian-friendliness – awnings that don’t turn into a waterfall between buildings, covered crossings. It’ll feel like a crawl to get around and that’s OK, Nelson Street shouldn’t be a drag strip, I agree transit times won’t change much and if it deters the princes of finance from sweeping into their corporate carpark in their Maseratis, great thing. It won’t of course, but hey. And maybe look at lengthening some light cycles to save air quality from heinous accelerate-and-brake emission bursts. Just keep it calm and flowing, maybe get rid of some traffic lights altogether. Expect some pushback against stinky diesel buses, horrid food delivery trucks, and builders’ Hiluxes (a complete order of magnitude smellier than VW’s demonised TDI), now they’re interspersed at street level. It’ll be a great thing for retail in Newmarket and Ponsonby as they become more attractive for those driving in, while Queen St caters to cruise ships. Let’s get on with it and see how it goes. I’m not sure I see the point in the consultation? I mean is there any possible logical argument that could be made against this change? PR exercise? I agree. It’ll also be atrocious as a PR exercise. I suggest that people who want a safer more liveable Auckland should actually submit that safe speeds isn’t something they should consult on. The exact choice of which roads through suburbs should have separated infrastructure with higher speeds, and which should just have lower speeds, is appropriate consultation. But the general thrust of whether we have a safer environment should not be something that’s up for negotiation. Given the Minister’s views on VZ I would have thought the appropriate starting point was to change the legal requirement. Look at this another way. The consultation outcome may be strongly supportive of change, and this may help to silence the merchants of doom. Without consultation the Hoskings of this world will moan and criticise in their opinion pieces about a lack of democracy and AT will get thoroughly bashed. Best to have the consultation and ensure it’s strongly favourable to change. Certainly in the Wellington consultation posted about recently, twice as many people wanted lowered speeds in the cbd as didn’t. Or is this just some clever negotiation? Put up 30kph as the preferred option across the CBD, wait for public outcry, compromise with 40kph across the region. Since it’s not accompanied by the public education campaign they committed to, I believe you are correct. Except they won’t do across the region, they’ll just do it in certain areas. 10% of our roads was always substandard anyway. I hope not. There is a big difference in cyclist and pedestrian deaths between 30 km/hr and 40 km/hr. I’m surprised it’s only CBD. It should be each local centre as well. Basically wherever there are larger numbers of pedestrians. I was really annoyed with Goff’s comments. Typical, gutless politician with no ounce of leadership or vision. You can’t have it both ways. Either you are serious about safety and fully endorse the speed limit change, or you are just paying lip service and care more about votes than people’s lives. You could see it that way. Or you could see it that Goff is much better off sitting on the fence if it means he gets re-elected compared with taking a side and possibly losing out to a right wing anti progress mayor. There was an opportunity for him to front the Vision Zero campaign, and he’s not stepped up. Other mayors in other cities have done so; those are the cities to watch as they ditch the car dependency and become liveable. This was an opportunity for a transformational change, but Goff’s buried his head in the past. I think there will be a slow transition. On day one there won’t be enough support for Vision Zero to allow the mayor to fully get behind it and also get elected next time. At some stage this will change. The other cities where mayors have done this are probably already more progressive or less car dependent that Auckland is (or Hamilton where you can meet Vision Zero by doing nothing). Yes I could read what Goff did in two ways really. Wouldn’t be too hard on him regarding these comments, because he knows the evidence does shows less deaths with lower speeds. He is just letting or hinting that AT should do as what is required which should be lowering the speeds as it’s obvious & the natural course of justice. AT is also meant to be somewhat independent of the council & mayor so perhaps doesn’t want to be seen to be telling them what to do and hence, yes, so too much right-wing backlash risking the whole safety programs being really watered down. This is the key phrase. Hopefully it’s not meaning specific DSI in specific places but more general evidence from world wide studies etc. …man I should be a politician. 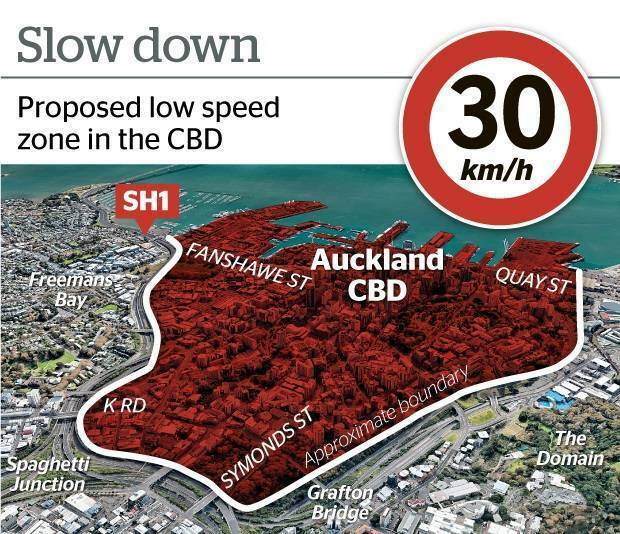 I think 30 km/hr for the whole CBD is a great idea. If it is a question of evidence then it should happen. There is already lots of evidence from other cities that 30 km/hr is a practical speed for a CBD. In terms of fatal crashes, the evidence against our current approach is sadly also already in. There will be other incidental benefits too. The overall slower top speed will make little difference to capacity or average speed. But it might help deter through traffic using streets like Quay and Beach Road as a defacto bypass of the CMJ for east west trips. So I predict we will see drops of traffic from this, precisely where there is a desire to improve amenity and pedestrian access, with no drop in city mobility. People going into the CBD will not complain about this. The only people who will complain are those who want to do 50 km/hr going through the CBD to somewhere else. And that is what needs to be stopped. I also agree with Pshem that places like Newmarket, Manukau and Onehunga would benefit from the same change. What evidence is needed? I’m pretty sure it is a very well known fact (for centuries) that lower speed = less deaths and injuries. Is anyone actually debating that? Yes, they are. People are trying to blame pedestrians and cyclists for the rising DSI, and arguing that there’s no point to reducing speeds. And other people think pedestrians and cyclists are always blameless. Yes no always. Just the overwhelming majority of the time. Exactly. This is the approach that would be taken on any rail system where safety is a primary not a secondary consideration. Other cities have stated quite clearly that they are lowering their speeds across the entire city because of the mode shift to walking and cycling that happens with lower speeds. The healthier lifestyle that this mode shift engenders isn’t just feel-good either – it results in a far lower medical, health and social spend. Plus it eventually results in lower traffic volumes, so driving is better, too. Please widen the zone to include all the inner city suburbs. Ponsonby, Newmarket, and Parnell at least. These areas already have high pedestrian activity and enhancing pedestrian amenity will further enhance commerce. Pedestrians buy things, and transact business, cars do not. The bulk of the high speed multi-lane, inner city roads are in the area inside the motorway ring anyway, so widening the zone to these suburbs, will have little effect on car transit times. Interesting Spinoff article suggesting that lower Queen St should become a pedestrian precinct, no vehicular traffic. I assume GA would not support this idea as it would then be illogical to run railway lines through lower Queen as there would be a risk of compromising pedestrian safety – which was the main reason for making it pedestrian only. Maybe the LR should course around Aotea square, share Aotea CRL station and continue down Albert St either surface or above CRL tunnel. 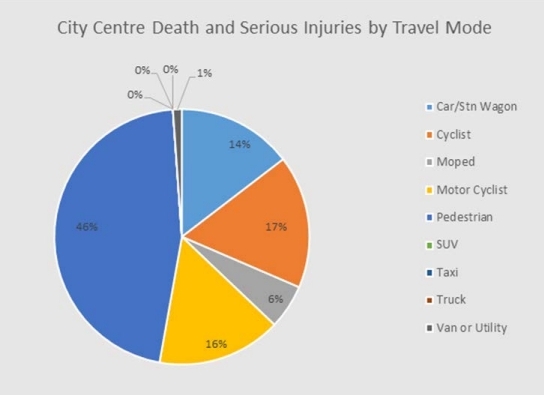 Does anyone have statistics on the number of incidents of pedestrians hit by cars in the CBD? And (said tongue in cheek), perhaps we can adopt the practice from the early days of railways and have someone walk in front of each car in the CBD with a flag to warn pedestrians of danger? !